Remarketing is an advertising technique that lets you show ads to people who have visited your website. If you have never used remarketing, perhaps it’s time to start. There are numerous reasons: customized messaging, a better chance for conversion, lower cost per click, and lower cost per conversion. One of the biggest struggles for small businesses when it comes to advertising is finding a large enough group of prospective customers to make it worth the effort. When you layer on too many targeting requirements, you’re left with an audience that’s too small to scale. To make matters worse, advertising to a small group can cost just as much as advertising to a larger, less-targeted one. You really can’t lose with remarketing campaigns. It gives you a more highly-targeted visitor without all the research or the designer price tag required by other ad formats, especially when conducted on a social platform like Twitter. The benefit of Twitter remarketing is that if your messaging is unique, personal, and not overtly ad-like, then you can do well. 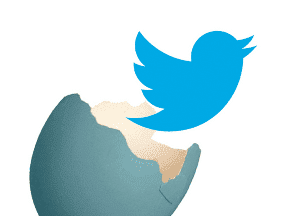 People love feeling special, and Twitter ads are just the place to convey that emotion. For example, a message that says, “A Twitter special just for you! Get 10% off everything,” is going to perform better than “Get 10% off everything.” If you have categories on your website, you could setup custom remarketing lists for each one and send even more highly-targeted ads. 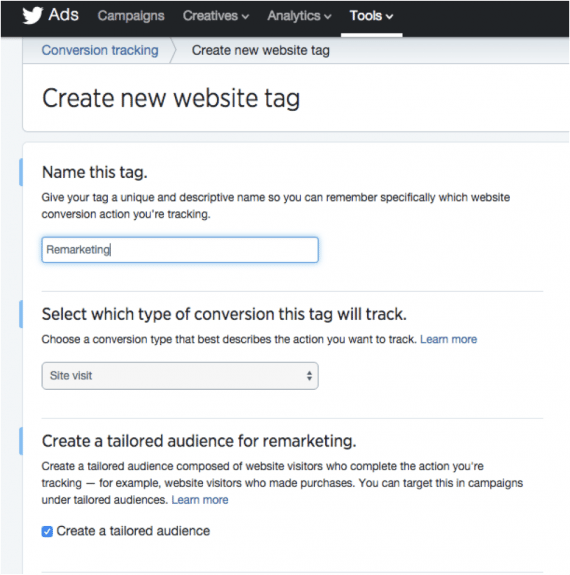 Here’s how to set up a Twitter remarketing campaign. I’m going to assume you already have a Twitter ads account. Step 1: Create a conversion pixel. The first step is to create a conversion pixel on your website, which will enable you track sales conversions. Click on “Create your first website tag” to make a new pixel. 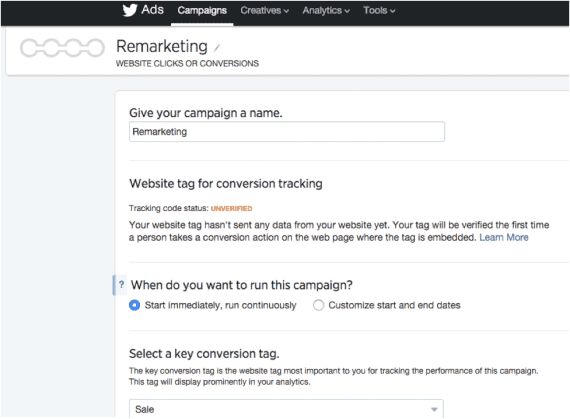 Label the pixel “Remarketing” and set the conversion type to “Site Visit.” Most importantly, leave the box checked for “Create a tailored audience,” which will give us the ability to remarket. Once you’ve entered the information, click “Save tag and generate code snippet.” From there you’ll be presented with the pixel HTML code, which you should place on each page of your site. 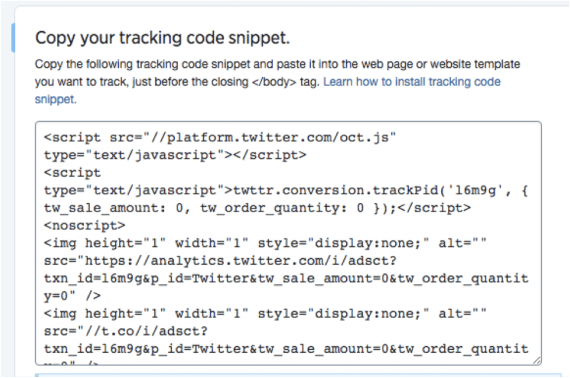 Copy and paste the tracking code snippet to each page of your website. Step 2: Create a new campaign. You’ll need to wait a few days until you have tracked a sufficient number of enough users to launch an audience. When you do, it’s time to create a campaign. 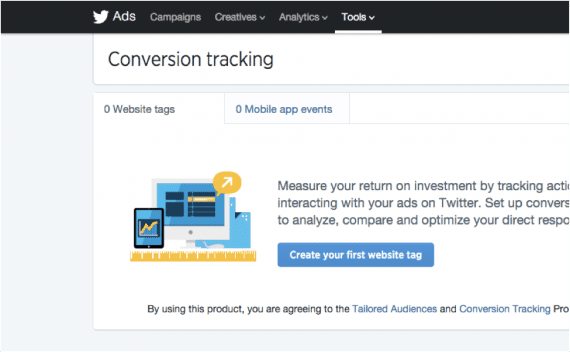 Navigate back to ads.twitter.com, and click on “Campaigns” in the upper left corner. 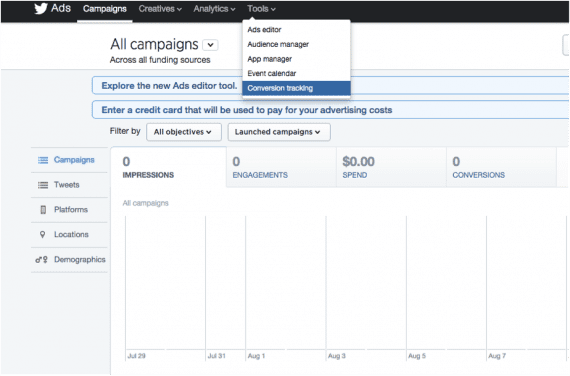 From there, click the “Create new campaign” button and choose the objective. For this tutorial, let’s select website clicks or conversions. Create a new ad campaign. Step 3: Name the campaign. Once the campaign creation screen loads, give your campaign a name, then choose the sale conversion pixel that we created earlier as the key conversion action. Make sure that its status is set to “verified,” otherwise you might launch a campaign that has no tracking. Give the campaign a name. 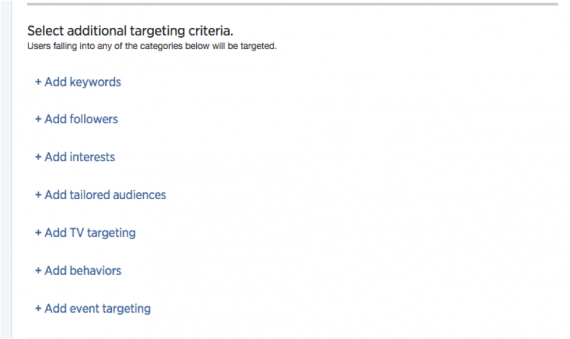 Step 4: Finalize targeting. Scroll past the creative section — we’ll do that last — and finalize the targeting. For this example, we only sell shoes in the U.S., so that will be our location. Our site is in English, so let’s choose “English” as a language. Step 5: Select device settings. Let’s choose desktop and mobile for the device setting. On mobile, we’ll only show ads to iPhones, Windows Phone, and Android devices, as they typically have larger screens. We’re not going to activate any other targets, as that will result in further reducing the audience size. If you have a bid price in mind, set it by entering it as a target bid (where it will bid up to 20 percent more) or a maximum bid (where it will bid no more). 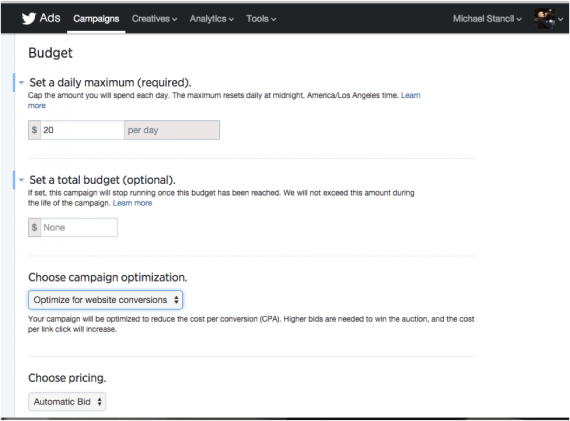 The bid is based on cost-per-click, not cost-per-conversion. 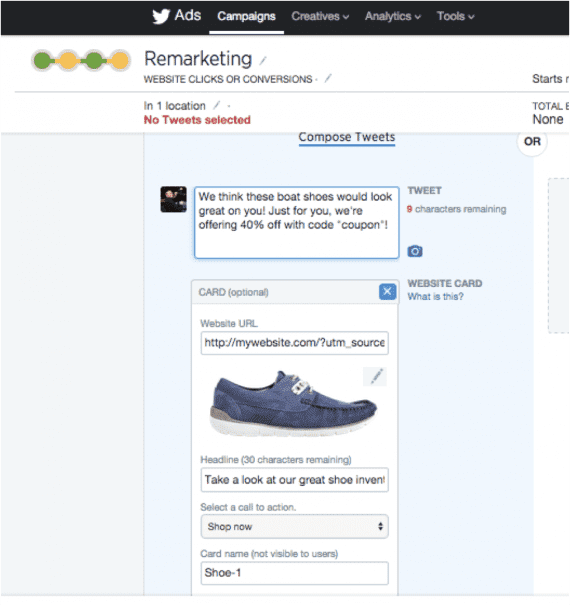 Step 7: Create tweets and Twitter cards. Now that the campaign is set up let’s create the tweets and Twitter cards. In this case, we’re going to create two tweets but only one website card, as we want to test which tweet copy performs better. 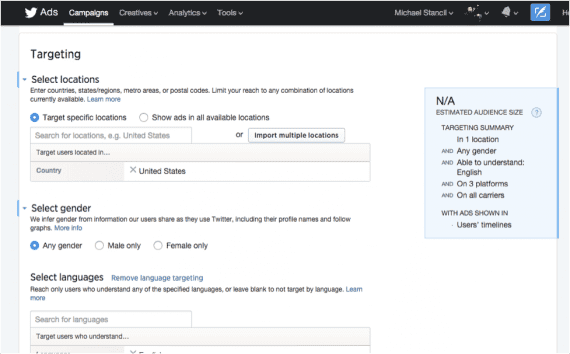 Create tagged links for the website card; untagged Twitter traffic often shows up as “Direct” in Google Analytics. Create tweets and Twitter cards for use in the campaign. After you create the tweets and card, click on “Tweet (promoted only),” which publishes the tweet to your timeline, but will only be visible if used in an ad. Someone who visits your profile organically won’t see it. “Promoted only” tweets are only visible as ads. Step 8: Launch the campaign. The tweets are done, the settings are correct, so it’s time to launch the campaign. Click the “Save and Review” button to start the campaign now or save it to begin at a later date. 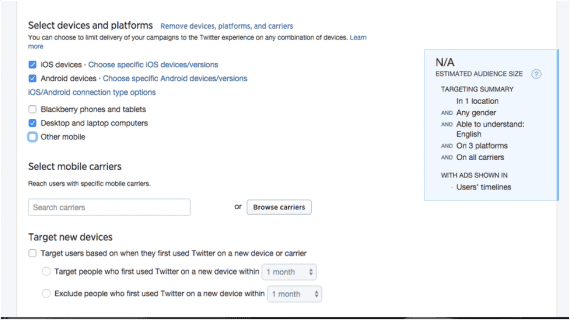 Lastly, Twitter will add new users to your remarketing list automatically, so check performance and ad copy frequently.